On my last visit to the Coastal Growers Farmers Market in Saunderstown I picked up one of Casey Farm’s pastured chickens. The only hassle about buying humane pasture-raised chickens here in the Providence area is that I have only been able to find them frozen whole which once defrosted yields me enough protein for a whole week’s worth of meals! When I commit to making an entire chicken I like to get the most out of it, so I’ve come up with ways to make sure nothing goes to waste. On day one I roasted the chicken with garlic, lemon and herbs and served it with a chickpea and vegetable salad. On day two I took all of the leftover meat from the carcass and made a couple grilled barbeque chicken pizzas and some chicken salad for sandwiches later in the week. Finally, I took the entire carcass and simmered it in a big pot of salted water for a few hours along with some fresh garlic greens. I strained the delicious stock and put it in the freezer for a future pot of soup. Given that today was a particularly rainy, dismal, and chilly spring evening, I thought it to be the perfect opportunity to use the beautiful stock awaiting me in the freezer to make a warming, wholesome soup. Also in my freezer was a pound of grass fed ground beef from Watson Farm (also sold at the Coastal Growers Farmers Market). My husband and I have been craving grilled burgers, so I decided I would use ½ pound of the beef in a large pot of mini meatball soup and the other ½ pound for the burgers later on in the week. As an aside, I should note that 1/2 pound yields me two dinner portions and 2 lunch portions since I make my burgers using 1/8 pound of beef each and load the bun up with lots of fresh veggies. Now, 1/8 of a pound of beef doesn’t make for a very impressive burger patty all by itself, so one of my favorite ways to stretch the ground beef in hamburgers (and meatballs) is to add plenty of old-fashioned rolled oats. Not only do the oats add texture but they also will help keep the meat moist by soaking up any runaway juices. I digress… This soup is absolutely perfect for one of those unusually cool spring days that make you reminisce about the hearty soups of wintertime. I typically make it with escarole, but decided this time on the fresh swiss chard and spinach that I picked up from Four Town Farm in Seekonk yesterday. For those of you not counting your calories, add a few cooked tortellini to each serving bowl for a treat. Combine the onion, garlic, ketchup, parsley, oats, ¾ teaspoon sea salt, pepper, and egg in a small bowl. Add the ground beef and mix till just combined. Form into small ½” round balls and place on a parchment paper lined cookie sheet. Bake for 10 minutes. Spray the bottom of a large stockpot with olive oil. Sauté the onions and carrots with ½ teaspoon sea salt until the carrots are tender. Add the chicken stock and bring to a boil. Chop the greens into bite-sized pieces and add to the pot. Simmer until greens are tender, approximately 5 minutes. Turn off heat and stir in the baked meatballs. Season with salt to taste. Add a few cooked tortellini to each serving bowl if desired. Enjoy! Melissa, can I come over? :-) Soup to me right now is what it must feel like to someone that needs drugs (haha). I was thinking of soup on my ride home and now I am reading this! 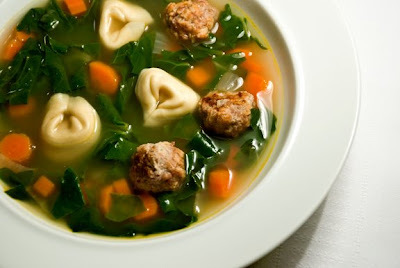 Even if I didn't have a cold, this soup looks SOOOO delicious! I love your philosophy about nothing going to waste.